To improve emotional resiliency & well-being for all. The decline in emotional well-being is one of the worst problems our society is facing today and is leading to a global epidemic. As per the WHO, depression is now the leading cause of mental and physical disability. TrustCircle is a mental health care startup that utilizes mobile & AI technology to improve emotional resiliency & well-being for all. TrustCircle is unique in the fact that it empowers all individuals to assess, track, and learn about their emotional well-being, gain access to on-demand care, and community support anytime, anywhere - anonymously. TrustCircle even touches the lives of those who are illiterate and below the poverty line by empowering Community Health Workers with simple, secure, multilingual, and scalable solutions. Organizations, cities, counties, and states can leverage TrustCircle's data-driven model to identify high-risk population segments/areas and take proactive action to promote health & well-being within their community. 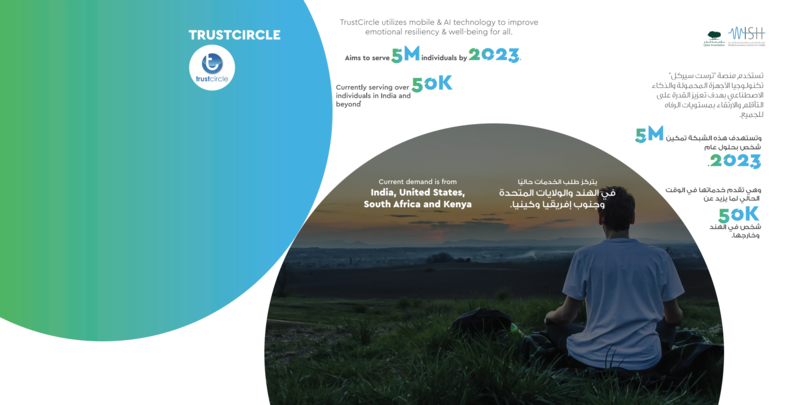 One of the most effective ways to bridge the gap of the ever-increasing demand for emotional well-being is to empower every individual to take charge of their own wellbeing, this is exactly what TrustCircle does. TrustCircle is currently serving everyone age 15 and above by building a preventive model that gives individuals access to assess, track, reflect, and improve their emotional wellbeing free for life. TrustCircle catalyzes capacity building and task shifting by training its partner network who in turn empower their community members and help create awareness, understand risks, take proactive action, and prioritize emotional well-being in their communities. TrustCircle partners include corporations, universities, schools, hospitals, community organizations, and governments. In addition, TrustCircle has also built a global well-being advisory council with global leaders who are the guiding light and helping scale TrustCircle impact globally. 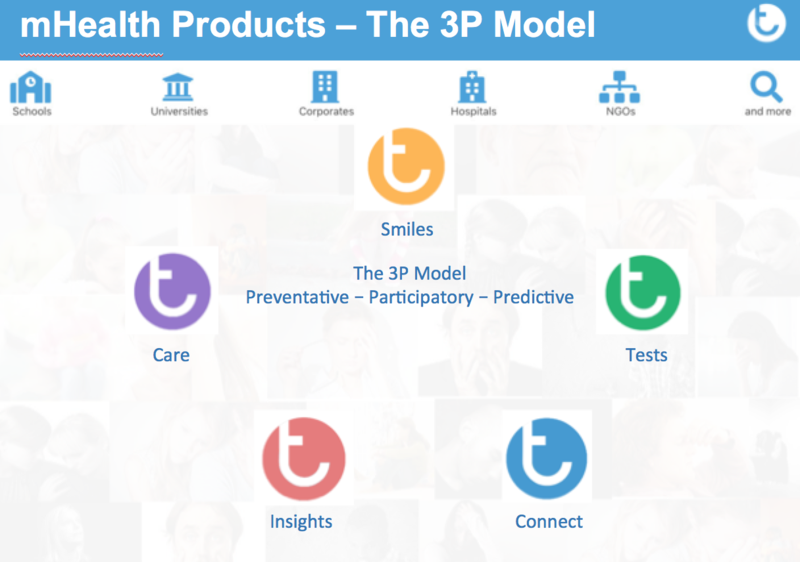 mHealth Smiles - A research-backed platform that helps you understand your emotions better to improve your well-being. mHealth Tests - Free validated mental health assessment tests for life, preventative & early intervention public health model, empower all individuals to assess, track, learn about their mental health proactively. mHealth Connect – Builds an inclusive society and collaboration model of carefree community support for life, anonymous peer-peer support locally or globally. mHealth Insights - Organizations will gain access to real-time mental health insights for its community, identify high-risk areas/population and take action. mHealth Care – An on-demand care network of trustworthy experts for individuals and enterprises. TrustCircle mHealth solutions are all based on existing research and clinically validated standard assessments used globally such as the 9 Item Patient Health Questionnaire (PHQ9) for Depression, the 7 Item Generalized Anxiety Disorder Assessment (GAD7) for Anxiety and the Percieved Stress Scale (PSS) for Stress. Twenty years ago, founder's brilliant brother was diagnosed with Schizophrenia, and quickly ostracized by community in India. To date his family is looking for solutions to two core problems: access to trustworthy community support and access to scarce mental healthcare providers. As per the World Health Organization more than 450 million people suffer from a mental or behavioral disorder, facing stigma and are served by only 200,000 Psychiatrists globally . Mental Healthcare is in a state of CRISIS and the world needs an alternative solution now. TrustCircle is the alternative solution that solves both these problems.